This project is located in Léry, Québec; a quaint town situated on the south shore of Lake Saint-Louis. It was designed by local landscape architect Martine Boudreault (l’Espace Paysage) and installed by Matière de Goût. It took the team of 7 men 8 weeks (approximately 3000 hours) to complete the nearly 4000 square foot job. In the front and back yards, over 900 square feet of Graphix wall was used to build raised planters, create elevated surfaces, and camouflage footings. A total of 3200 square feet of Blu Grande slab in Greyed Nickel and 400 square feet in Onyx Black were used to clad surfaces and create customs steps, wall caps, & even the pool coping. In the front, 400 square feet of Industria paver in Greyed Nickel was used to frame the asphalt driveway. The goals were simple. The homeowners wanted a versatile & refined patio area in the backyard, and a grandiose entrance in the front, all in a contemporary style. The outdoor design needed to bridge the gap between the stately home and the landscape in achieving equilibrium between the organic and inorganic materials. The view of the property seen from the lake was also a priority in the design. The property was purchased after a teardown, leaving only a few mature trees and an existing rocky shoreline. The homeowners were forced to compromise on their initial ultra-contemporary design: the municipality rejected their original architectural plan and insisted that the style be in keeping with the surrounding traditional fieldstone-clad homes. The result is a sleek & stunning modern structure with hints of traditional materials. The challenge lay in underlining and emphasizing the contemporary feel that the homeowners desired without competing with the landscape and clashing with the style of the other homes. The architects that drew the plan for the house positioned the two raised patio areas on either side of the pool, at the same level as the patio door. When seen from the lake, this massive concrete elevation threw off the balance between the home’s modern design & natural setting. Keeping in mind the desire to create a welcoming and open view from all angles, the team needed to soften this element and camouflage the poured concrete footing of the elevated terrace and pool. The foundation of the home was lower than the water level and the drainage system to protect the home needed to be planned and then concealed. This was considered as well. 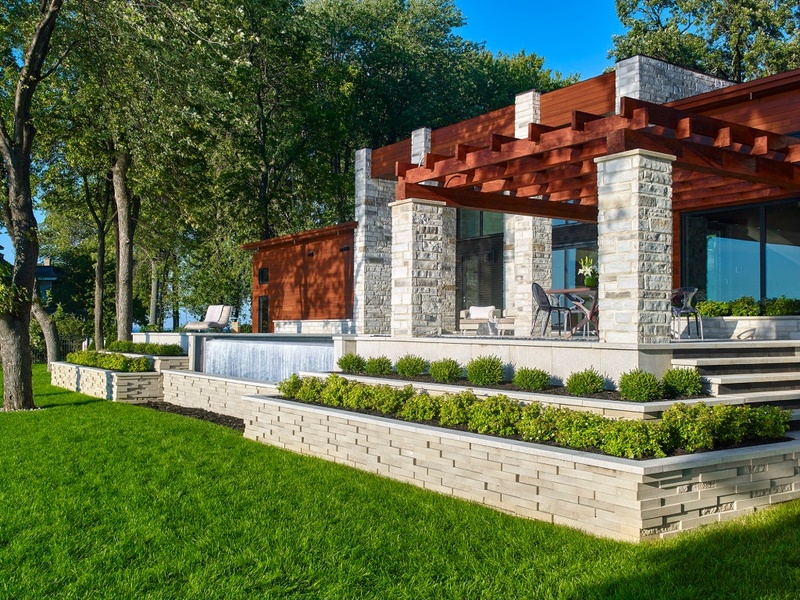 In keeping with the goal of achieving contemporary style that blends with the natural surroundings, the designer selected Techo-Bloc for their modern textures & subtle tones. Versatility was crucial as well. The Blu slab in polished Greyed Nickel underscores the existing modern aesthetic with a monochromatic smooth surface that also complements the home’s masonry. The Grande version of this slab was chosen for its oversized dimension, resulting in clean lines and a geometric look. The new polished texture adds the glassy, granite-like finish that really sets this design apart. 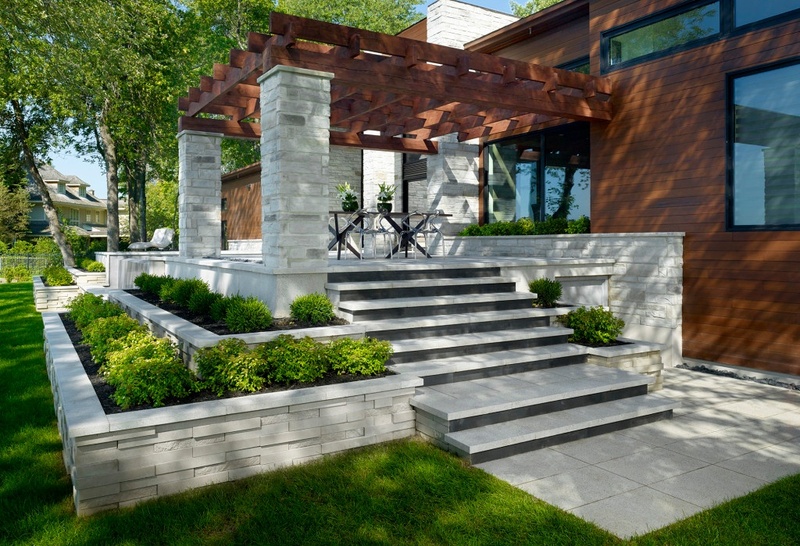 Blu outdoor stone slabs were used throughout the project – the custom outdoor steps were created using Greyed Nickel for the run and Onyx Black for the rise. These slabs are manufactured with spacer ridges which had to be polished away in order to achieve the tight joints and smooth visible edges. The same was done for the pool coping. The Graphix wall was selected for its contemporary, three dimensional, appeal. In fact, the homeowners spotted this wall and insisted on its use – the designer welcomed the bold choice. The height of the raised platform that surrounded the poolside was easily camouflaged with tiered planters and the visible concrete footing was veneered with custom cut Graphix wall pieces. In order to soften the visual impact of the structure, an infinity pool with a waterfall edge was built. Seen from the patio, the continuity between the pool and the lake creates a serene and open view. Seen from the water, the cascade interrupts the linear & constructed feel. The patio sections on either side of the pool were clad with Blu Grande, resulting in clean and versatile surfaces for entertaining, lounging, etc. The water management system that was put into place to minimize potential flood damage was unsightly. The Graphix wall was used to create an elevated buffer, which the designer strategically planted with boxwood and ornamental grasses to catch the eye. The simple yet vibrant green foliage creates a beautiful contrast with the muted tones of the hardscape and serves to further tie the design to the landscape. The success of this project can be attributed to three things: the quality of the design itself, the installer’s outstanding skill level, and the innovative approach to material use. The attention to detail and the care put into creating the custom elements are evident. When master craftsmen have a great design, the right tools, an open & inventive mindset, as well as versatile building blocks; outdoor dreams can be achieved.